IPL is an abbreviation commonly used for Intense Pulsed Light. 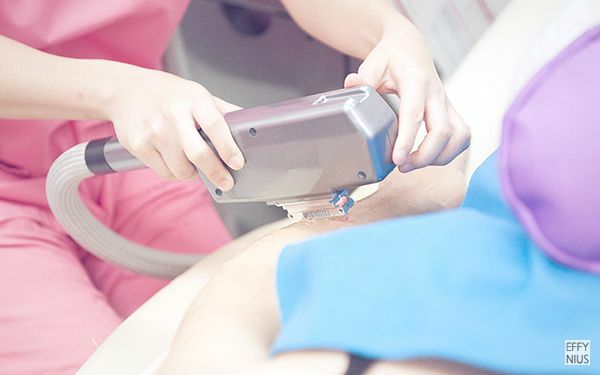 A technology similar to medical lasers which is used by cosmetic and medical practitioners to perform various skin treatments for aesthetic and therapeutic uses including hair removal, photorejuvenation, and treatment of dermatologic diseases. Unlike lasers, however, IPL uses a carefully selected broadband spectrum of intense light to target the melanin pigment in the hair, the melanin of pigmented lesions, the hermoglobin of vascular lesions or the porphyrin molecules associated with P. acnes bacteria. IPL is the gold standard for these indications because of the excellent results, comfort level and minimal risk of compilcations. The light pulses only works on hair follicles which are actively growing at the time of the treatment. Hair will continue to grow from follicles which are not active at the time of the treatment. 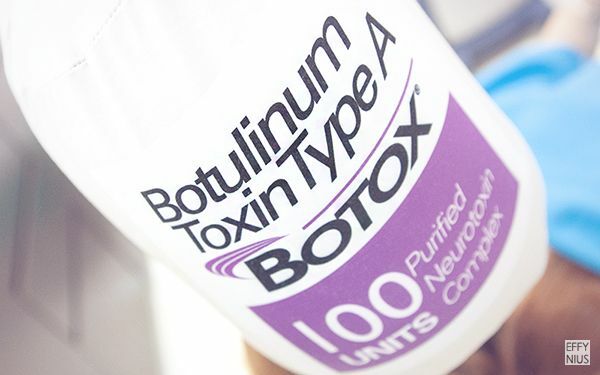 This means that a course of treatments – intensitivity and number of sessions depending on individual hair growth – may be needed before results can be seen. Since young, I face the taunts of people around me about my hairy self – of what my brother would say, “山豬腳” (wild boar’s leg), or worse – an ape. I am named the hairiest person in the family – yes, even in comparison with my Daddy and Brother. As a lazy woman myself, I am not exactly keen on religiously shaving my legs. Lazy to what extend you may wonder – well, it usually takes me a year (probably even more) just to change the blade of my razors. If you are as lazy as me, you would understand why I really hate the idea of shaving every now and then – especially that I have horrendous thick black hair (from over-shaving since donkey years back) and lighting-speed hair growth. As mentioned in my previous post, there are many other benefits of Laser Hair Removal Procedure. And this is the main reason for my decision on IPL Hair Removal Treatment. No more waxing, plucking, and shaving. My Hairy Arms and Legs. First, let’s have a look at my hideous arms and legs. Are they really able to remove all of these unsightly hairs, giving me clean tofu skin? Well, we’ll see. Notice that my arm hairs are a lot finer because in close to 3 decades, I did waxing only once on the arms. Whereas for my legs, it was regular shaving for close to 2 decades – every few days to a week, or whenever there are occasions. 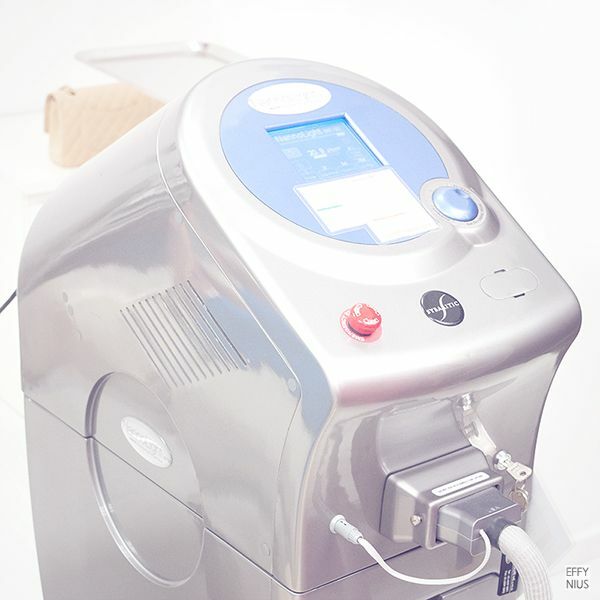 First, let me introduce you the machine so that you have a better idea on what is treating you. The clinic uses an IPL system that incorporates an intergrated cooling tip which provides you with the most comfortable treatment. This comfortable feature cools the skin surface, minimising any discomfort and risk of tissue injury during each pulse. By cooling the skin surface, proper amount of light energy is adjusted to penetrate and disable hair follicles without risk of harm or discomfort. On a side note, before I share with you the entire IPL Hair Removal Procedure, I just HAVE to post up these photos. 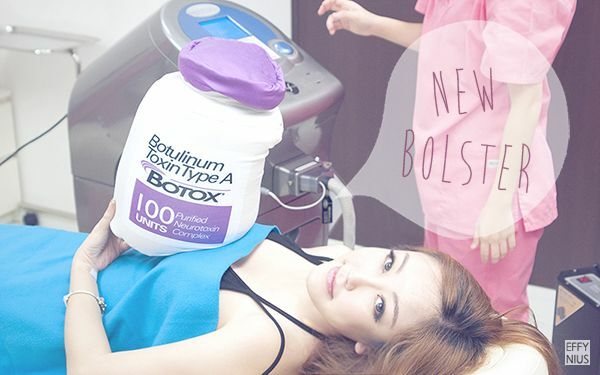 They have replaced their comfort cushion with this cute little Botox bolster! Now, let’s be back on track. 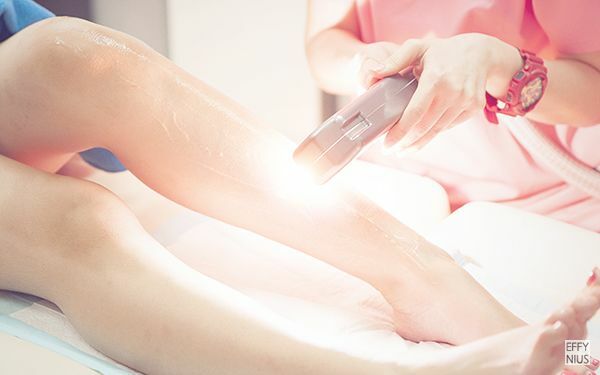 I am going to share with you the entire IPL Hair Removal Procedure so that you have a better idea on what to expect during treatment. 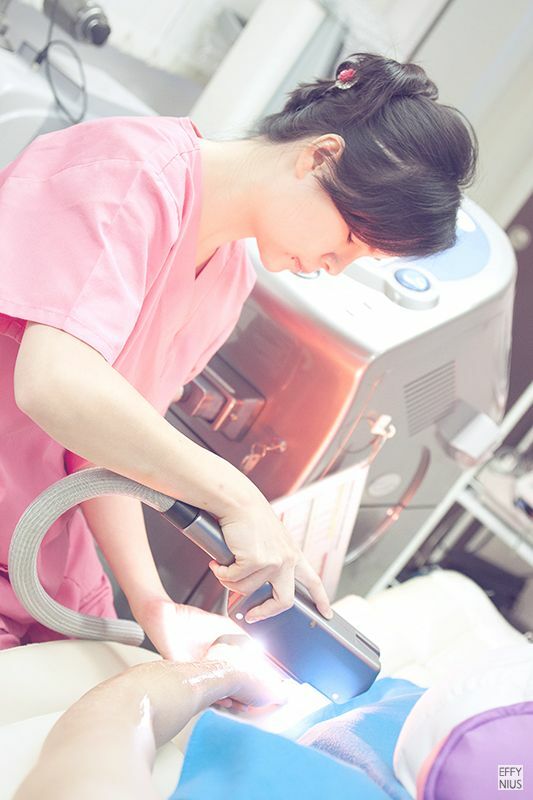 The areas to be treated are shaved a few days prior to the laser hair removal treatment. 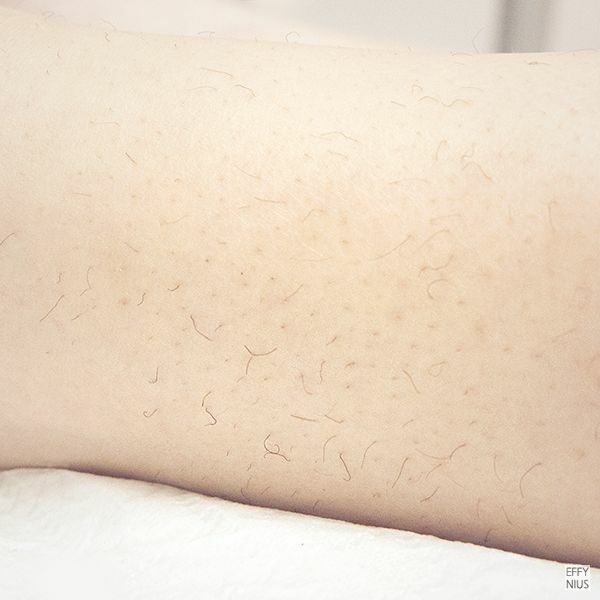 A certain amount of hair is needed for this procedure so do not shave right before treatment. It is advised to keep the hair short so as to minimise the pain (if any) during treatment. Patient is required to wear special googles that are designed to filter out harmful light during the treatment. A cooling gel is then used on the treatment areas for more comfort. And look where she is applying on – all the way to my fingers. Yes, I have hairs on my fingers. Comparison of My Leg Hairs Before And After IPL Hair Removal Treatment. The treated area may be red and rashes may occur. However, they should resolve within the next 24 hours. The treated area may also be sensitive for a short period of time. 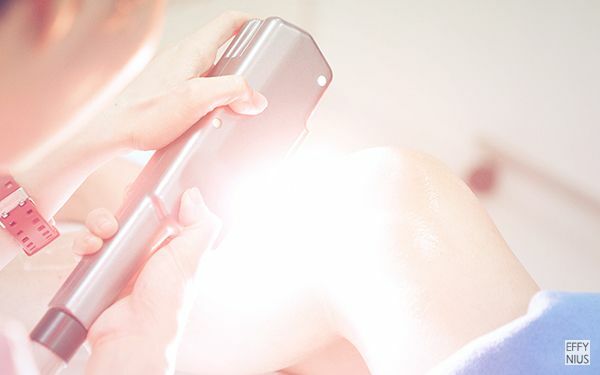 Light-based hair removal treatments may cause skin blisters or burns. Did you see how my leg hair curls up right after treatment? Patients are advised to avoid sun exposure and tanning 1 week before and especially after the treatment. Other than that, there is nothing to avoid. Of course, it is going to take some time to see the difference – especially that I have massive hair growth. And the area of hair growth – although not with immediate effect – is noticeably lessen in just a couple days after treatment. Hello, did your hair start to fall off few days after treatment or smthg? And how mang treatmenrs have you done? Thank u!